I was riding my bike down on the Roaring Run Trail last week looking for arriving, migrating birds when I noticed something else entirely. Crawling across the gravel surface of the trail along with a surprisingly small number of forest millipedes (“surprising” because I have notes from last year at this time that the trail was absolutely covered with these millipedes!) were an equally small number, but regularly occurring, crossing parade of gypsy moth caterpillars. 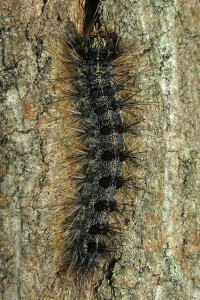 Gypsy moths (Lymantra despair) were/are one of the great invasive scourges of our eastern forests. A brief review of their history: they were brought to North America (Medford, Massachusetts to be precise) in 1869 by Etienne Leopold Trouvelot who intended to breed them with Asian silk moths so that he could develop a domestic silk industry. 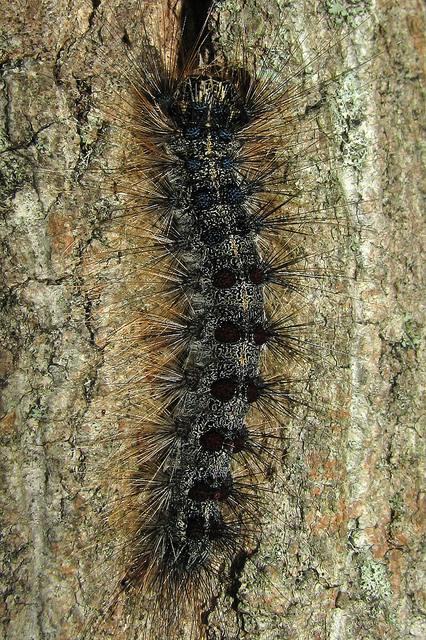 The gypsy moths escaped from Trouvelot’s home and quickly became a recognized pest in the oak forests of New England. In 1906 the U.S Department of Agriculture released an exotic, European parasitic, tachinid fly (Compsilura concinuata) to try to get the exploding gypsy moth populations under control. Over the next eighty years the USDA repeatedly released more and more of these tachinid flies throughout affected forests in a vain attempt to control the spreading gypsy moths. As pesticides were invented, they were thrown at gypsy moths, too. Pathogenic fungi were also developed and used to weaken and reduce the gypsy moth masses. There are still significant areas of Pennsylvania where gypsy moths are an overwhelming pestilence, but many more areas of forest where they have become a baseline part of a tolerable equilibrium. Maybe the pathogenic fungus was the key weapon for control. Maybe letting the population become so dense and unstable triggered a crash from which the species has not yet recovered. Either way, biking along Roaring Run Trail and dodging a few crossing gypsy moth caterpillars is so much better than the slipping and sliding over thousands of their crushed carcasses just 25 years ago! Unfortunately, though, those tachinid flies that were released during eighty years of fruitless attempts at biocontrol became established in North America and are doing a great deal of harm. Let’s think about these parasitic flies and how they interact with their host caterpillars. First, many parasites of moth caterpillars lay their eggs on the surface of the skin of the larvae. Since larvae go through a number of growth and skin shedding stages (their “instars”) many of these surface eggs are in fact shed with each instar molt. Also, many of the moth parasites are very specifically matched to a species of moth caterpillars. Consequently, the parasite becomes active only during the seasonal activity time of the host caterpillar and has a very focused and direct impact on a specific moth species. These two features of the host/parasite interactions enable both species to reach equilibria populations in which persistence of both species without explosive growth is achieved. Compsiulra concinnata, our introduced tachinid fly, however, exhibits none of these focusing or restraining parasitic features. This tachinid fly inserts its eggs into the body of a host caterpillar. 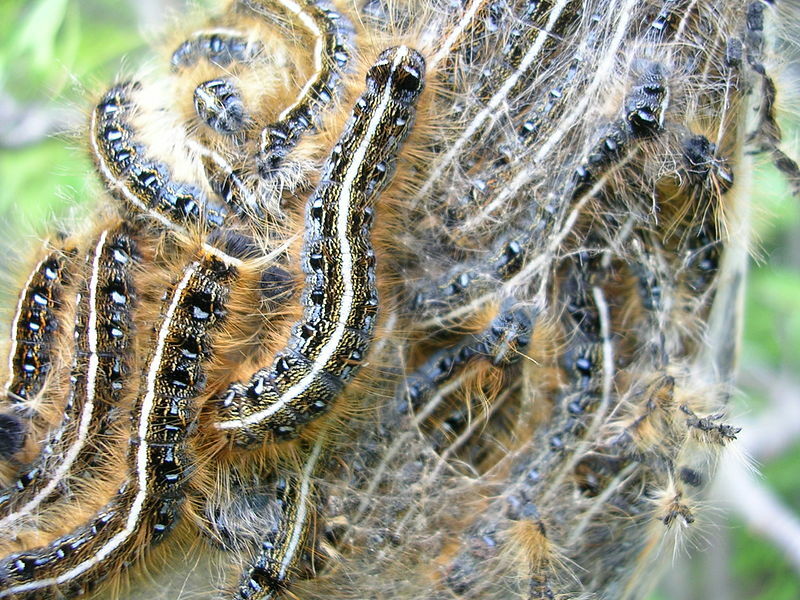 No skin molting will shed the lethal parasite eggs once they have been injected into the caterpillar. Also, this tachinid fly displays the antithesis of host specificity. It parasitizes nearly two hundred species of Lepidoptera (moths and butterflies), Coleoptera (beetles) and Symphyta (sawflies) in North America alone. Further, C. concinnata instead of having its life cycle timed to the seasonal cycle of a particular host has the ability to have up to four generations in a single year. Each generation will encounter different butterfly, moth, beetle or sawfly species and have deleterious impacts on each of them. There was, then, no targeting of C. concinnata on gypsy moths! 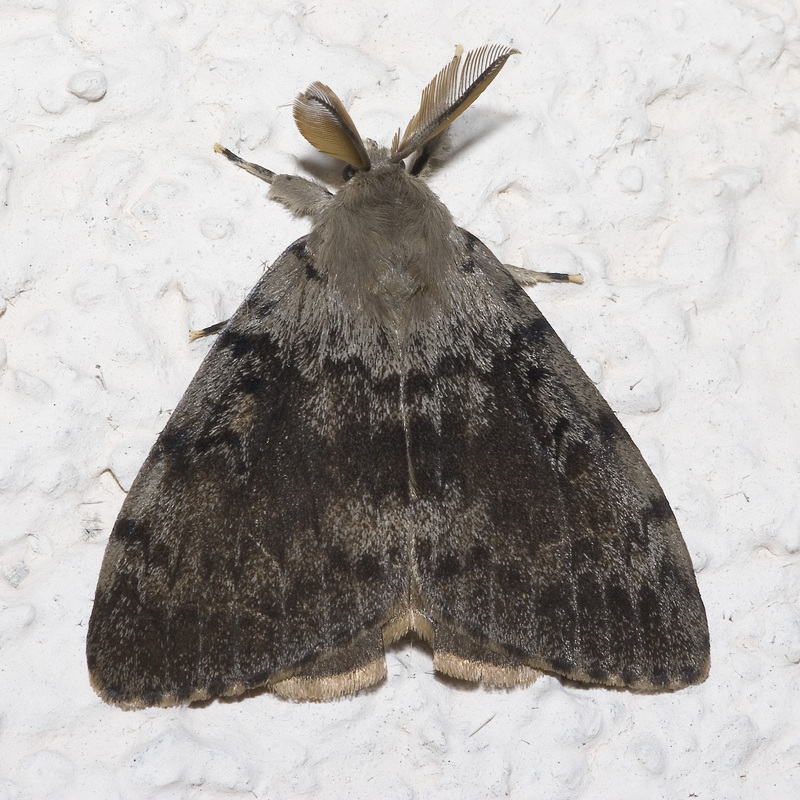 Almost every native moth and butterfly species in North America was exposed to this aggressive, generalist parasite! Monarch caterpillars are killed by C. cincinnata, as are luna moths, cecropia moths, polyphemus moths and promethea moths. The decline of these “giant silk moths” in particular has been observed throughout their North American ranges, and some experts feel that C. cincinnata is responsible for over 80% of their population loss! The orioles time their mating and egg laying and nestling emergence to the abundance of the eastern tent caterpillars! Fast food for fast growing nestlings! As John Irving once wrote in his novel “The Cider House Rules,” “be of use!” He could have been describing the tent caterpillars! So, caterpillars are all around us! Some are vestiges of a colossal, human generated disaster and others are enmeshed into the natural trophic network and serve as the primary fuel for some glorious baby birds. Sunlight to leaves to caterpillar to majestic orioles: it sounds so simple! Aha! I am glad to hear that the tent caterpillars are fast food for the Baltimore Oriole! We’ll be on the lookout for our orange feathered friends especially since the tent caterpillars in our woods are particularly multitudinous this year (and no use to us at all!). Thanks for the gypsy moth history, Bill–many lessons to learn from attempts to control them. What a shame that the introduction of the tachinid fly resulted in losses of so many other moths. Sigh. 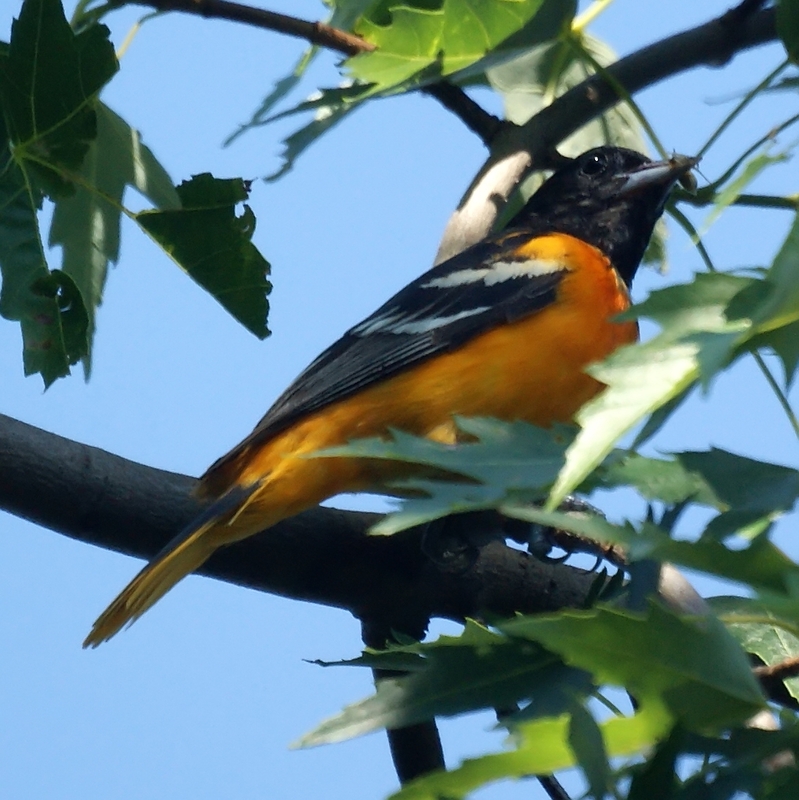 But seeing a Baltimore Oriole or two will lift our spirits.